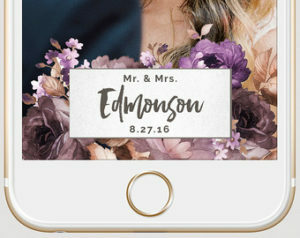 Snapchat’s rising popularity means saying goodbye to wedding hashtags and hello to wedding filters. If you’ve never heard of Snapchat here’s the 200-character crash course: It’s a social media platform that allows friends to share a snapshot of their life with their social circles. The best part is? it disappears after either one viewing or 24hrs depending on how you post the picture or video. This may sound silly but consider it a quick glimpse into the every day life of your friends, sometimes it’s boring, but more often than not it’s funny, meaningful and intimate. And if you really like the moment you shared, you can save it to your phone and post it elsewhere. Snapchat offers the ability for users to add their own filter (a graphic to appear over your image) for your friends and family to utilize. This means you can mark your wedding venue or your rehearsal dinner (or both) with a special image to share with your friends and family. But before you rush into submitting a filter, there are a few things you need to know. A Snapchat team reviews all filters 24 hrs before their scheduled posting and they require at least 24 hrs to do so. This means that if your filter doesn’t get approved you don’t have much time (or any) to get a new filter sent through the approval system. Usually they are flexible if you react quickly, but there are no guarantees so it’s important to follow their guidelines. There are quite a few rules. To name a few: no photographs (drawings are okay), no discouraging or adult content, no hashtags, no personal information, and no cluttered design. Click here to learn more. If you want to design your own, the file must be submitted as a .png. This means that if you don’t have a design program on your computer, you will need to hire a freelancer (check out Task Rabbit and Etsy for inexpensive options as low as $8). If that sounds like too much trouble, you can use their online workshop to update an existing template (this will also make the approval process much easier). Depending on your location, the cost is actually quite nominal. Before you submit your filter, you can draw out the radius you want it to be available in and for how long to determine the cost. The less “busy” the area of town you are in is, the less expensive the filter will be; prices start as low as five dollars. The last step is to make sure your guests know the filter is available. Write out the Snapchat reminder on a chalkboard near the guestbook and get ready to enjoy the crowd-sourced social media!